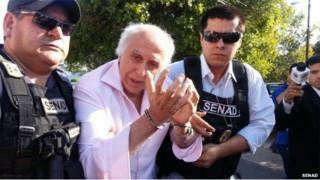 Police in Paraguay have arrested a fugitive Brazilian fertility doctor, Roger Abdelmassih, sentenced for sexually abusing 39 of his patients. He had been on the run since 2011, after being convicted to 278 years in prison for assaulting women at his fertility clinic in Sao Paulo. Abdelmassih was well-known in Brazil and treated many celebrities. He had been living with his wife and two children in an exclusive district of the Paraguayan capital, Asuncion. His arrest by officers of Paraguay's National Anti-Drugs Secretariat (SENAD) followed a joint investigation with the Brazilian authorities. Abdelmassih, 70, has been taken to the Brazilian border city of Foz do Iguacu and later will be transferred to Sao Paulo, where he committed his crimes. Despite the long sentence, under Brazilian law he can only serve a maximum of 30 years. Some of the women he abused posted messages on Twitter and Facebook celebrating his arrest. He was originally arrested in 2009 after being denounced by a former employee. Thirty-nine women came forward to say he had raped or sexually abused them during medical examinations or when they were in recovery rooms after receiving fertility treatment. Some said they were abused when they were recovering from sedation. The abuse took place between 1995 and 2008. He said that he was never alone with any of his patients, and has suggested that some may have suffered hallucinations brought on by an anaesthetic. Abdelmassih was convicted in 2010 and was initially allowed to remain free while he appealed against his sentence. But he fled Brazil a year later when a court in Sao Paulo ordered his arrest.